The City of Rifle is a Home Rule Municipality in Garfield County, Colorado, United States. The population was 9,172 at the 2010 census, up from 6,784 at the 2000 census. Rifle is a regional center of the cattle ranching industry located along Interstate 70 and the Colorado River just east of the Roan Plateau, which dominates the western skyline of the town. The town was founded in 1882 by Abram Maxfield, and was incorporated in 1905 along Rifle Creek, near its mouth on the Colorado. The community takes its name from the creek. Rifle is located in the valley of the Colorado River where Rifle Creek joins from the north. Most of the city is on the north side of the river, but there is some city land to the south. Interstate 70 passes through the city along the south side of the river, with access from Exit 90. I-70 leads east 26 miles (42 km) to Glenwood Springs, the Garfield County seat, and southwest 60 miles (97 km) to Grand Junction. U.S. Route 6 runs along the north side of the Colorado River through Rifle, providing a local parallel route to I-70. Colorado State Highway 13 intersects I-70 and US-6, passing through the southern and western parts of Rifle, then leading north 41 miles (66 km) to Meeker. 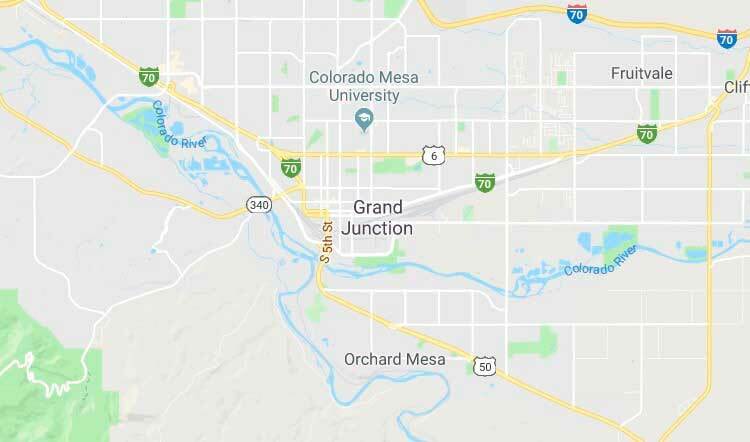 According to the United States Census Bureau, the city of Rifle has a total area of 5.7 square miles (14.7 km²), of which 5.6 square miles (14.5 km²) is land and 0.1 square miles (0.2 km²), or 1.18%, is water. As of the census of 2010, there were 9,172 people, 3,221 households, and 2,230 families residing in the city. The population density was 1,581.1 people per square mile (610.6/km²). There were 2,586 housing units at an average density of 602.7 per square mile (232.7/km²). The racial makeup of the city was 81.0% White, 0.5% African American, 1.3% Native American, 0.6% Asian, 0.1% Pacific Islander, 13.4% from other races, and 3.1% from two or more races. Hispanic or Latino of any race were 30.4% of the population.